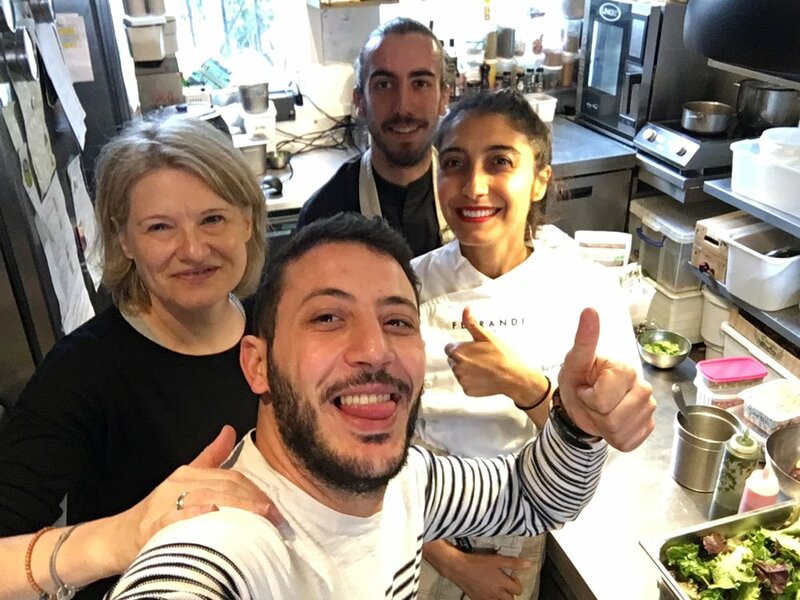 I recently took on a new job & responsibility when I started working as the brunch Chef at APETI, a beautiful, organic, plant-based, charming restaurant in Paris. Located in the 6th district (arrondissement), just a few steps from Le Bon Marché, and from my culinary school Ferrandi, this gem has brought so much into my life in so little time. I am so grateful for this experience for many reasons, and I wanted to share with you what working as a chef has brought to me, and how cooking even for yourself at home or for your guests, can be a tremendous opportunity to grow within yourself. 1️⃣ Learning continuously: every shift allows me to learn something new. Be it from the interactions from clients or our team, and of course when I reflect on my own. There are always ways to improve and do better, and when you walk in with an open mind and heart, the teachings just pour your way. 2️⃣ Hellooooooo multitasking: you know when you watch the maestro of an orchestra who so swiftly ensures you enjoy the show? How every instrument, every note, every sound, every movement must be in harmony? Well, in the kitchen it’s a similar experience. For the service to flow smoothly, fluidly & flawlessly, and for the food to taste sensational, it’s all about team cohesion, effort, anticipation, preparation, working together and putting your whole heart and love into it. It’s a beautiful thing. 3️⃣ it also allows you to stay grounded and humble and isn’t the most glamorous of jobs let’s be honest: from smelling like food, to standing for hours till your feet hurt, to cleaning piles and piles of dishes, to scrubbing the floors and counter tops cristal clean, it’s a tough environment and it’s tiring. But its so worth it, for me anyways. Once the service is over, the cleaning is over and everything is spotless, everything sinks in and you’re so grateful for what you’ve accomplished. It also feels like wiping the slate clean and getting to start fresh every time you walk into the kitchen. 4️⃣ The creativity it sparks: its like having a blank canvas and infinite possibilities to draw on. So much inspiration, creativity, beauty, originality can go into one dish. It’s a beautiful thing. 5️⃣ The empowerment you feel and the gratefulness to feel responsible for a team: wanting to make sure they enjoy their experience in working with you, wanting to lead by example and be a leader. And I am so lucky to be working with incredible people, which isn’t always easy to find in such a volatile industry where high turnovers are the name of the game. 6️⃣ It becomes home: the team, the restaurant becomes your home away from home. A safe place, where you know everything will be alright. A place where you know you’ll feel supported, where your team has your back, and where you can even forget about the hardships or challenges you may be facing outside the kitchen, in the ‘real’ world. It feels like a little protective cocoon, well to me anyway; and I appreciate that very much. 7️⃣ The community it creates: it is so nice when we have regulars come in, and where face become familiar. Again, it feels like a family, expanding. Be sure to follow us on instagram @apeticuisinevegetale & facebook . I work there two weekends a month, so if you’d like to know the days I am there please do write me, come say hi and have a yummy delicious meal with us! Ami, the head Japanese Chef, as well as Ruben & Corentin are other chefs you will encounter, different personalities, and wonderful human beings. I encourage you also to come another night or for lunch, to enjoy APETI, enjoy the family feel and of course, enjoy the FOOD! I still have so much to learn & to explore, and I am grateful to get to share this journey with you. Thank you for taking the time to read. Please do comment below or write to me. I always love receiving your heartfelt messages, or thoughts. And constructive criticism is always welcome too.